Looking for a quiet safe place to ride, drive or just rest your horse for awhile? Do you have to wait for arena time? Perhaps you are getting ready for a show and need an indoor arena to put the finishing touch on your horse. Maybe you even want to stay a little warmer this winter. Then you have come to the right place, GOLDEN HORSE FARM. Located in New London, Ohio, this beautiful facility was built in 1998 and designed with the horseman in mind. The newer built stalls are dry and cleaned daily. The indoor arena is large enough for riding or driving. If you prefer to be outdoors, the surrounding area has quiet trails and roads for riding and driving and is close to several County and State Parks. Things you won’t find at Golden Horse Farm….overcrowded arenas, boarders competing for use of the facility or the noise of the city. A virtual retreat for you and your equine partner. Owners Barb and Dan, recognize the need for high standards and offer a top notch sport horse and driving friendly facility. 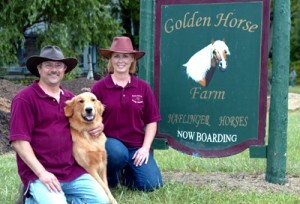 Combined driving enthusiasts, as well as Haflinger horse breeders, Golden Horse Farm is home to several National Champions. With over 40 years of horse care experience, every horse is guaranteed to be safe, secure and treated kindly. At Golden Horse Farms they take pride in attention to detail as well as professional and personal care unmatched in the industry of quality horse care.